The global incinerators market is set to grow with a CAGR of 4.22% throughout the forecast period to reach US$ 18.2 Bn by 2026. SANJOSE, United States - March 22, 2019 /MarketersMedia/ — According to a new market research report published by Credence Research “Incinerators Market (Product Type – Fluidized Bed Incinerator, Rotary Kiln Incinerator, Catalytic Combustion Incinerator, Multiple Hearth Incinerator and Liquid Injection Incinerator; Application – Agricultural, Livestock, Industrial, Municipal and Medical) – Growth, Future Prospects and Competitive Analysis, 2018 - 2026”, the global incinerators market is set to grow with a CAGR of 4.22% throughout the forecast period to reach US$ 18.2 Bn by 2026. 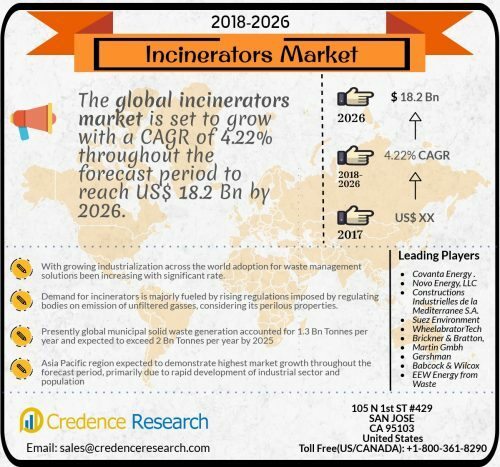 Overall incinerators market set to experience the growth of 4.22% across the forecast period, chiefly due to rising attention towards environment and growing effect of pollution on human health. Incineration is oxidation of combustible material contained in the waste, where waste is highly heterogeneous material, consisting of minerals, organic substances, metals and water among others. The general objective of incineration with waste management is to treat waste thereby reducing its volume, whilst capturing or abolishing potentially hazardous substances. Incineration process also enables recovery of the energy, mineral and chemical content from waste. During incineration process, flue-gases are exhausted that contains majority of available fuel energy as heat. This leads to significant offset in the use of other fuels as well as reduction in Greenhouse Gas (GHG) emissions. Due to such wide area of application, there has been increasing demand for incinerators worldwide, thereby driving the market growth. Incinerators are used across various agricultural, livestock, industrial, municipal and medical applications to manage the waste and evade hazardous pollution as result. Growing demand for incinerators from these sectors to protect the environment is expected fuel the market growth in following years. 10.3 Constructions Industrielles de la Mediterranee S.A.
10.4 Suez Environment Co. S.A.
10.6 Brickner & Bratton, Inc.
10.9 Babcock & Wilcox Co.